Figure 1. 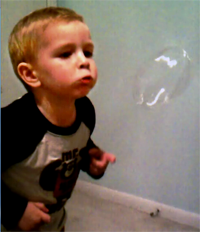 Soap bubbles are not only fun, they are micelles. Chemicals which have an amphiphilic nature (hydrophilic and hydrophobic portions) inherently have the capacity to form micelles in aqueous solution. Micelles are generated when the hydrophobic portions are driven to an interior structure while hydrophilic portions are turned outward facing toward the water. Common applications of this technology apply to a variety of surfactants (surface active agents), detergents, soaps, lubricants and other uses. Additionally however, polymer micelles can be used for drug delivery as the hydrophobic interior has the capacity to hold drugs which are poorly soluble in aqueous solution. This web site discusses just a few uses of polymer micelles as well as the application of PolySciTech products to these uses. Why would a copolymer form a micelle? Most PolyVivo block copolymer products are inherently amphiphilic as they contain both hydrophobic polyester blocks (PLA, PLGA or PCL) and hydrophilic poly(ethylene glycol) blocks (PEG). When placed in water, the total molecular weight (MW) of the polymer as well as which block is controlling (e.g. the larger of the two) decides if the structure as a whole is water soluble. Table 1 shows relative PEG content for a variety of PolyVivo mPEG-PLGA diblock copolymers and you will notice "% PEG" is often listed for applicable products. Table 1. mPEG-PLGA diblock percent PEGs. For example, PolyVivo AK30 (mPEG-PLGA 5,000-4,000 Da) is water soluble to form a cloudy solution with 1% w/v. Upon shaking, a gentle foam is easily formed, indicating surfactant behavior of this material. Additionally AK09 (mPEG-P(DL)La 2000-2200) and AK09D (decyl endcapped version of the same) and a few others are also directly water soluble. In addition to these directly water soluble polymers others can be incorporated into water using an organic solvent to dissolve as an intermediary phase followed by dissolution with excess stirring or other conditions which encourage micelle formation. Note that because polymer chains can bend and flex triblock and other formations can form into micelles as well in addition to diblock copolymers. Below is a description of how this has been done at PolySciTech. The processes shown here are conventional and not claimed as intellectual property of Akina, Inc. Feel free to use this process for making liposomes in your own lab, preferably using PolyVivo brand polymers. A classic drug delivery problem is difficulty with IV injections of poorly soluble drugs. The requirement for large quantities of saline to dissolve such materials limits their clinical use. One common solution for this problem is to form drug-loaded liposomes by a variety of methods. Here "liposome" is used to indicate a micelle structure containing poorly soluble drug with a diameter <1 µm. Some may also refer to this as a "nanoparticle" or "micelle". Coumarin-6 (C6) (Fig 1) is traditionally used as a laser dye due to its highly fluorescent nature however it is commonly used as a model hydrophobic drug for studies involving release and tracking of localized delivery. The native solubility of Coumarin-6 in water is 0.25 µg/ml which is makes it a good model for hydrophobic drugs such as paclitaxel, everolimus, and others. This material is bright yellow, making it easy to see. AK01 is the catalog number for Methoxy Poly(ethylene glycol)-b-Polycaprolactone (2,000:5,200 Da) (Fig 2). It is a block copolymer of hydrophilic poly(ethylene glycol) and hydrophobic poly(caprolactone). This polymer does not dissolve in water when added directly. It is soluble in organic solvents such as dichloromethane. In solid state it is white powder but when dissolved it is colorless. The polymer was dissolved in dichloromethane (DCM) at a concentration of 5% w/v. Separately 2.5% w/v C6 was dissolved in DCM and added as 0.1 ml of C6 solution into 1 ml of polymer solution. This renders a solution such that the final ratio of drug/polymer was 5% w/w drug to polymer. As controls a negative control of pure DCM (no polymer) mixed with C6 was used. Figure 6. Stirring paddle setup. 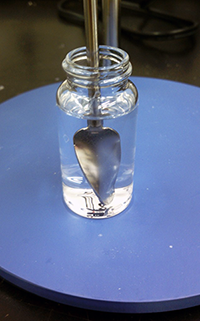 A 22 ml scintillation vial had 20 ml of distilled water put into it. It was agitated using a VWR “lab-egg” stirrer equipped with a screw drive at a rate of 2,000 RPM (Fig 3). While being stirred 1.1 ml of each polymer-drug solution was added to the stirring water 100 µL at a time and the whole was left to stir for at least 1 hour to allow for DCM evaporation. In order to remove a macroscopic scum layer each solution was first passed through a folded paper filter (qualitative, fast) by gravity. Following this each solution was loaded into a syringe and pushed through a 0.45 µm (450 nm) PVDF filter to eliminate any microparticulate manner. The filtered solution was considered to be the liposomal solution as anything larger than 450 nm had been excluded (Fig 4). Figure 7. Screening to size. After screening, solution stability was briefly tested by centrifuging at 2,000 RPM for 1 minute and then by allowing the solution to sit still overnight. After filtration the solution was pictured and it was clear that without the stabilizing polymer almost all of the C6 had been screened out of the control. By itself C6 lacks the solubility to be retained in water, however when co-dissolved with AK01 it had high solubility in water. These were diluted 1:10 in ethanol and tested by UV/Vis spectroscopy for C6 content at 469 nm and compared to known standards to obtain C6 content. The C6 control without had no measurable C6 content. The C6 content in the AK01 liposomes was 118 ±19 µg/ml (N=2, ±standard deviation) this is roughly 500 times the maximum solubility of C6 in water. Stability was tested by centrifuging the material at 2,000 RPM for 1 minute and no settling was observed indicating that the C6 was evenly dispersed in the aqueous phase and stabilized against settling (Fig 6). Figure 9. 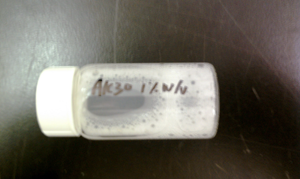 AK01-C6 liposomes before and after centrifugation. Using this method AK01 diblock copolymer has good functionality for generating stable solutions of poorly soluble C6 at up to 500X its maximum solubility. The above process was applies also to a series of other PolyVivo Polymers. In order to investigate the process of spontaneous micelle formation around a hydrophobic drug model a series of PolyVivo block copolymers were tested for this property in a manner similar to that as tested for AK01 (white paper). Briefly, the polymer was dissolved in DCM along with coumarin-6 (hydrophobic fluorescent dye) and dispersed with 2,000 RPM stirring into distilled water. Of the polymers tested PolyVivo's AK-01, -02, -03, -04, -07 and -10 were able to form micelles below 450 nm in size containing substantial amounts of coumarin-6 (note bright yellow color in vials in image above) while PolyVivo AK05, -08, -15, -16, -20 and -11 did not have this property. Each block copolymer has specific properties which relate to its usefulness for any given purpose. These formed micelles were tested via UV/Vis and their C6 content ascertained relative to the maximum solubility of native coumarin-6. This is not meant to serve as an indication of the maximum stable solubility just the level obtained during this processing. This is by no means the only way to generate micelles and many other groups have done research in this field with a wide array of polymers. Also check out the Morissey Lab Protocol for forming liposomes, Morrissey Lab Protocol for Preparing Phospholipid Vesicles (SUV) by Sonication.